We are happy to share this delicious and beautiful recipe from Yum Project friend, Liz Ritoli of Stone Soup Village Kitchen. She is another force in our local community, teaching cooking classes to kids at Downtown Greens and other organizations. Preheat the oven to 425 degrees. Wash, peel, and cut beets into 1/2 inch cubes. Toss cubes with olive oil, salt, and black pepper and spread out on a foil covered baking sheet. Lightly oil a small head of garlic and wrap in foil. Place garlic packet on the sheet with the beets and bake for 30-40 minutes until largest pieces of beet are fork tender. Cool beets and garlic. 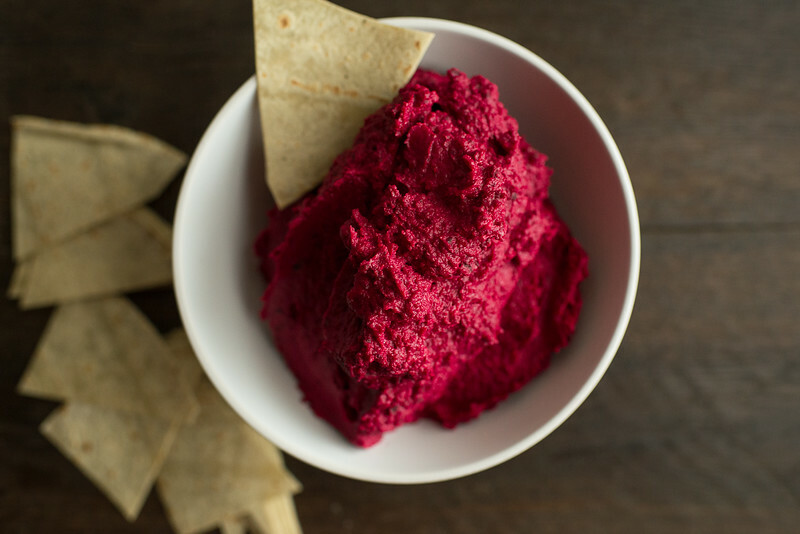 Blend beets, drained chickpeas, garlic, tahini, lemon juice, and cumin in the food processor until smooth. Serve cool or at room temperature with sesame seeds as an optional garnish. Serve with pita, vegetables, pretzels or eat it with a spoon!